Simms Fishing Products has announced the appointment of Bart Bonime to vice president of product design & merchandising for the company. Simms Fishing Products, preeminent manufacturer of waders, outerwear, footwear, and technical apparel in fishing, announced the appointment of Bart Bonime to Vice President of Product Design & Merchandising. Bonime has an extensive background in product design and merchandising, in addition to brand management and sourcing. For the last eight (8) years, Bonime served as the Director of Fishing at Patagonia. Under Bonime’s leadership, the FISH division was recognized for their product innovation and sustainability initiatives and received many awards. Prior to that, Bonime led Apparel Design & Sourcing for Redington Apparel, from the initial line launch to securing a dominant position in the specialty market with Redington’s value-priced product. Bonime also founded Go Fish Corporation in 1995, which was recognized as one of the fastest growing privately held businesses in Oregon in 1998 and 1999. Bonime’s career in merchandising commenced at Columbia Sportswear Company where he served as the Advertising & Promotions Director for almost 10 years. In addition to Bonime’s vast knowledge and experience in product design, merchandising, development and sourcing, he is ardent about environmental health and the broad range of issues that we are facing now and in the future, especially as they relate to healthy fisheries. 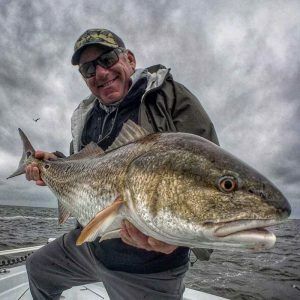 Simms Fishing Products: Established in 1980, Simms is the preeminent manufacturer of waders, outerwear and technical fishing apparel and accessories. Simms’ 80,000 square foot facility in Bozeman is the country’s only manufacturing facility for fishing waders. The full line of Simms gear is available at specialty and large format retailers across North America as well as www.simmsfishing.com.